This is the classic boardroom table shape. It conveys hierarchy, as those seated at the head(s) can see everyone else, whereas those seated along the sides must change their position according to who is talking. Increasing the length of the table actually increases the power distance between those on the sides and those on the ends; an unequal width to length ratio can sometimes reflect the unequal power that the head has over the rest. Whilst a rectangular shape is often the simplest choice, it will convey quite a lot about your business’ structure and attitude towards collaboration. This does not, however, make it a bad choice and it can be employed quite effectively. This kind of table offers two distinct advantages. Firstly, it sacrifices a large portion of the surface area and seating in order to bring the focus to the open side. This design is particularly useful during presentations, video conferences and product demonstrations (to name a few). A presenter is able to walk directly up to a viewer and speak directly to them or hand out materials. Secondly, the efficiency of the space and surface area can actually give the room a more productive feel. The chairs placed around these tables are usually quite comfortable. It represents a conscious choice, by the business, to use their space efficiently and to bring information to the forefront of the meeting. Attendants are, subconsciously, aware of this and, therefore, contribute more. 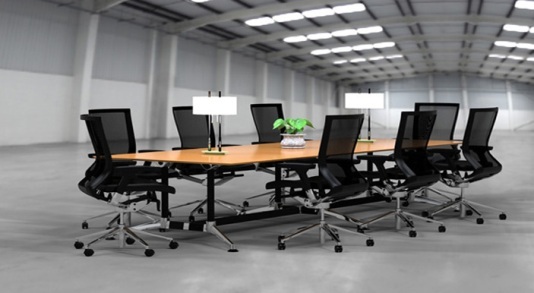 These sorts of boardroom tables can actually be a little off-putting when you see one for the first time. They do offer a number of drawbacks, including: a lack of personal surface area (for notepads, etc); difficulty talking if too large or uncomfortably intimate if too small; and presenters can find it difficult to offer those seated across and beside them the same experience. For all its faults, however, this shape does have one redeeming quality – equality. You will find that round tables are perfect for collaborative work environments, peer criticism meetings and even consumer interactions. Everyone will begin to view each other as equals as opposed to adversaries. Take a moment to think about the boardroom table that currently resides in your office’s meeting space – what shape is it? Then, take a moment to think about the kind of mood and attitude you wish to convey to your employees and visitors – does the table help or hinder this achievement? If you feel that a different shape would best represent the interests of your business, perhaps it’s time that you did a little research and took a shopping trip. My previous office has all the shapes you have mentioned and they have all served their purpose. But I like the U shaped ones. Have a great week ahead!